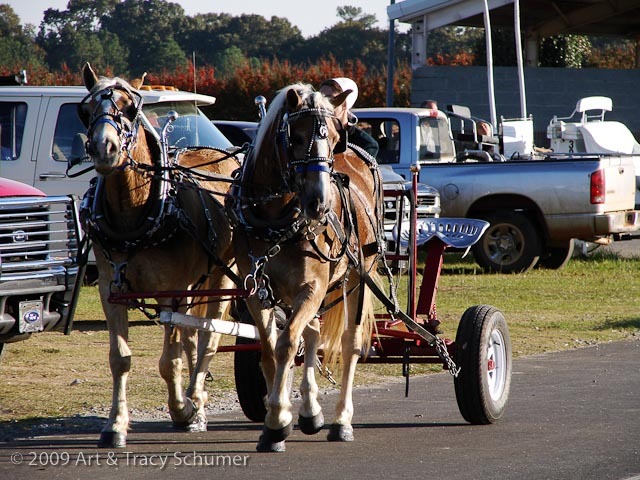 Standing in front of a long row of large barns at the Georgia National Fair Grounds, I looked on with interest as dozens of horses: draft, light harness, saddle horses, mules and ponies were paraded about in the parking lot by mostly Amish and Mennonite handlers. 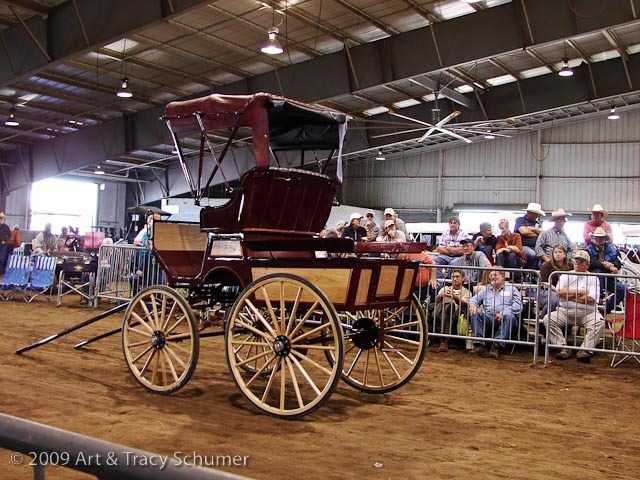 A large number of them had been hauled in from Pennsylvania, Indiana and Ohio for the Big Perry Sale, the largest horse and carriage auction in the southeastern United States. Trailers were still pulling in late in the day carrying everything from bundles of harness and tack, all types of carriages and farm equipment to children’s wooden toys and furniture. A rusty red stock trailer drew my attention- it had Ohio plates and had obviously been on the road for several hours. As soon as the truck came to a halt, two young bearded men dressed in Amish attire hopped out of the backseat of the cab.The livestock box of this rig was no more than twenty feet long but it was a solid mass of horseflesh. With such a heavy load to carry, the fenders sat so low over the axles they were rubbing the tires bald. A steady stream of urine left a stinky trail which became a flood once the rear door was opened. I counted as eighteen dehydrated, scruffy-looking ponies were unloaded and lead into one of the barns. It was a disturbing scene, and just the sort of thing that draws negative criticism of the Amish. 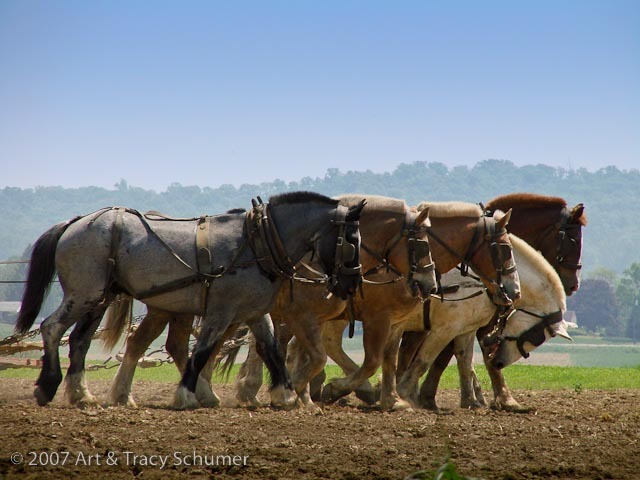 For modern horseman, however, it’s nearly impossible to relate to the mindset of the Amish who, for the most part, still live in the nineteenth century. We’re simply too far removed from the generations that went before us; our ancestors who depended on draft animals to power their lives. We don’t have the perspective of what it was like to have to harness a horse every time we needed to drive to town. But for the Amish and Old Order Mennonites, this is their normal daily existence. It is possible, however, to gain a glimmer of insight from our own lives and create a frame of reference into the days when, instead of being tucked under the hood of your car in the garage, horsepower was chewing hay out in the barn. Go to your local auto salvage yard sometime- look over the heaps of worn-out, wrecked, and demolished vehicles. We don’t give it a lot of thought actually, we buy cars to get us around, after a few years we trade them in on newer models. Cars break down, we get into accidents, some people are very meticulous about maintaining their cars while others drive them until there’s nothing left but a hulk waiting to be hauled off for scrap. Now let’s travel back in time a hundred or so years ago- this is what happened to horses. Draft animals were everywhere, pulling everything: the milk wagon, the city street car, the school bus, the mail cart, freight, fire engines and families headed to church on sunday. Some people took very good care of their horses while others didn’t. Horses broke down, horse drawn vehicles got into accidents, and when draft animals lost their usefulness they were dropped off at the local sale, the slaughterhouse or the offal dock. “It’s very difficult for us to see the horse as a person in the nineteenth century did,” said John Parker during a recent lecture he gave to the Carriage Association of America, Parker is an expert coachman, carriage historian, and director of the British Driving Society, “People didn’t love their horses then the way we do today, horses were tools; a means of transportation.” Just as society has progressed, attitudes towards animal welfare have shifted and changed. Search the online archive of the New York Times and you’ll find dozens of news items reporting cruelty towards horses dating back over the newspaper’s entire history. As far back as the eighteenth century, there have been laws in place to regulate the treatment of draft animals. The arrival of the automobile was a celebrated moment for many, especially animal welfare groups. Just as some people abused their animals centuries ago; a portion of the population will continue to abuse animals today and they’re not always Amish. Within any given group of people, Amish, Mennonite or “English”, for example, a curtain percentage will be abusers. For people who depend on their animals to survive, however, the percentage of abusers is far less; it’s simply not profitable. Among recreational horse owners in particular, a lack of knowledge and carelessness are the most prominent catalysts for abuse. For the Amish, who live and work with their horses everyday, this is clearly not the case. 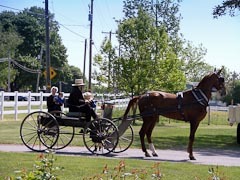 But indeed, the life of an Amish horse is very different from that of a modern horse kept for recreation. Modern recreational horseman are generally unaccustomed to seeing horses used daily for essential work. So when they encounter the Amish horse, who has been pulling a buggy back and forth over the same roads of a small Pennsylvania town for it’s entire life, they’re often shocked by the contrast. For recreational horseman, and even professional horseman within the recreational horse industry, the difference between a show horse and a horse used daily as a primary draft animal is often startling. Although we’re accustomed to seeing horses worked strenuously in competition who are very fit; Polo Ponies come to mind, or perhaps Thoroughbred race horses. The look of a primary draft animal is far different. The competitive, recreational horse is maintained at a very high standard of appearance. Owners regularly spend a lot of money for customized feed, specialized supplements, stabling, and grooming. Often, owners of even the most ordinary of backyard pets will follow a similar regime just to keep their special friend looking his best. The horse used as a daily driver is certainly not a pampered pet. On a hot day, a sweaty coat dries while the draft animal goes about it’s daily routine; waiting while parked in shade or open sun, then heading out again on the next errand. The sweat that formed a froth from under a harness dries and cakes. Long hours in harness take their toll, sores may develop and over time the hair no longer grows back in to cover the wear spots- it’s not a pretty sight, but is it abuse? Or Is it simply that our standards have changed? A judge in the ring at Walnut Hill would excuse a driver who presented a horse that looked this way- perhaps even raise an inquiry. But a young mother who is trying to get her children to school in a rain storm has different priorities. 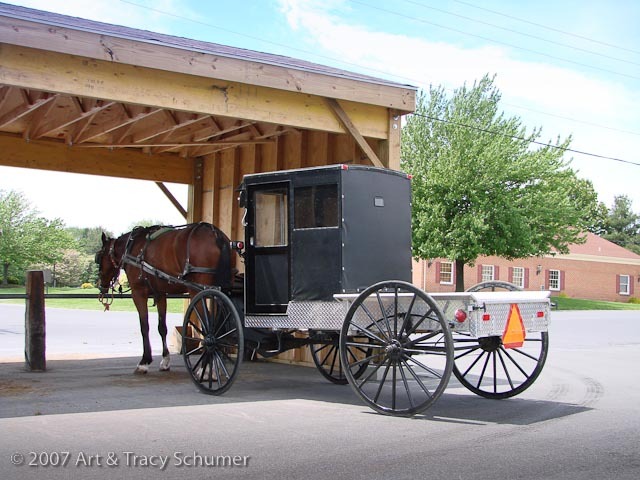 Make no mistake, the Amish do take pride in their horses. The horse used during the week to drive the kids to school is not the same horse that pulls the family to church on sunday. 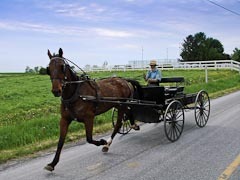 The Amish may be known as “the plain people” but they appreciate a fancy looking horse as much as anyone. The hard truth is, when a horse is depended on for essential daily work he’s going to look the part. The arrival of affordable, motorized transportation was perhaps the pinnacle achievement of the industrial revolution. It meant that city streets were no longer covered in animal manure and the air wasn’t filled with the stench of it. In large cities such as London or New York, prior to 1910, it was not uncommon to see carcasses of dead horses stacked along the side of the road, waiting to be carried off for disposal. Thousands died every year. Although humans have benefited greatly from the invention of the automobile, perhaps the horse has benefited even more. Freed from the burden of being the motor of transportation, he can finally be fully appreciated for the magnificent animal that he is. Just like us, the life of the average horse today is a so far removed from his ancestors that the differences could fill volumes on their own. Back at the fair grounds in Georgia, the sale started promptly at nine in the morning. Carriages were auctioned off first followed by draft ponies, heavy harness animals, and saddle horses. During the pony sale, a fine team of four well matched palomino Haflinger Ponies drew a lot of attention, as well as bidding, from the large crowd of spectators and buyers. 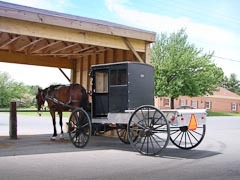 The Amish owner/trainer of the team had them put to a forecart and proudly demonstrated the young team’s excellent manners under harness in an enclosed, noisy, environment. 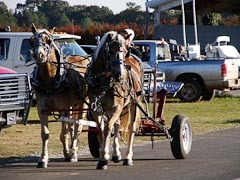 The four Haflingers were all geldings, aged three and four years.They remained quiet and under total control as the Amish driver maneuvered them up the narrow alleyway and into the main arena. Once he reached the far end of the sale pen, the driver turned his horses around by performing a perfect fanning maneuver whereby the forecart remained stationary while the team uniformly “fanned” around it in a continuous side pass. I often wonder, if it weren’t for the Amish, would this level of skill be completely lost in the U.S.? Recreational drivers as well as commercial carriage concession operators often depend on the Amish and Mennonites to supply safe, reliable draft animals. 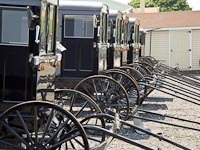 We buy Amish made harness and hand built carriages. The largest purchaser of Standardbred horses retired off the track are the Amish. 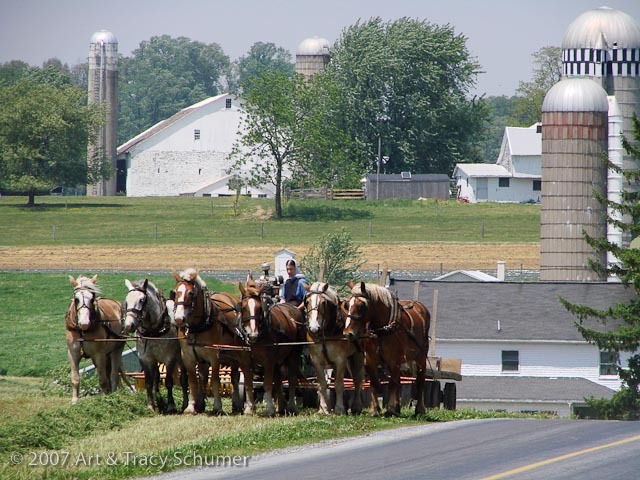 If you live in the northeastern U.S., chances are the hay you feed your horses came from the field of an Amish or Mennonite farmer. 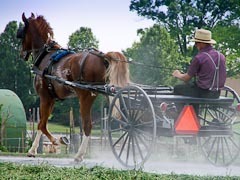 Abuse is never acceptable but perhaps due to their high profile as a horse powered society, the Amish are an easy target. The Amish may seem odd to some, a mere tourist attraction to many, but they’re a fascinating, valuable part of American culture and history. 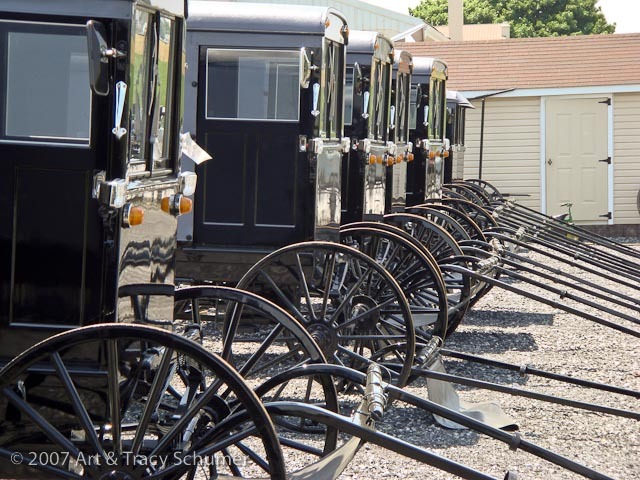 The ability to travel back in time may be pure fantasy but as long as we can still visit Amish country, for horseman at least, time travel doesn’t seem so out of reach.